Leave a comment for a chance to win a signed book from one of my series. Hi! Some of you might remember me from my brief time living in Scumble River. Back then, I was undercover as a motorcycle gang member name Tin Man or Tin for short. The chief of police wandered into my sting and I had to wrap up the operation a lot quicker than I had planned. Meeting Chief Boyd and his cute wife, Skye changed me. After a lot of soul searching, I realized that if I wanted to have any kind of life, it was time to stop participating in covert operations for the agency that employed me (I’m not allowed to name it) and find some other way to contribute to society. As it turned out, my change of career was too late to save my marriage—it was a goner from before the ink was dry on the license—but at least I did save my sanity. That is until my niece Ivy and her friend Dani Sloan entered the picture. Because my new job was head of security at Normalton University, my brother and sister-in-law asked me to keep an eye on Ivy. Ivy may be a genius, but due to a double promotion in elementary school, she is much younger, consequently a lot more naïve than her college classmates. After she and her two best friends Tippi and Starr got kicked out of their apartment and went to live with her old neighbor Dani Sloan my new peaceful world went all to hell. Dani inherited an old mansion that had been in the process of being turned into a bed and breakfast, but instead of running the place as a B&B, she decided to start a culinary company called Chef-to-Go. She agreed that Ivy, Starr, and Tippi could rent rooms from her if they were willing to work for her business. Originally, this all sounded like a good idea to me. The girls would have some adult supervision and working never hurt anyone. But then, one of Dani’s first catering clients was murdered and a crooked cop was determined to convict her, or one of her employees, for the crime. Which is when, I had to step in and offer my help. I’m going to do everything in my power to help Dani figure out the identity of the real killer. And not just because the chemistry between us is off the charts. Both of us have too much baggage to act on the attraction, but that doesn’t mean that I’m willing to see her go to prison for a crime she didn’t commit. --New York Times bestselling author Denise Swanson lives in rural Illinois with her classical composer husband and whatever wildlife wanders into her yard. She writes the Scumble River, Devereaux’s Dime Store, and the Chef-to-Go mystery series. Denise also writes the Change of Heart and Delicious Love romances. Absolutely adored "Tart of Darkness" and have left very positive reviews every where and tell everyone about it in my personal life. So, anyone reading this that hasn't read the book - just DO IT. You will not be disappointed. Thank you for the opportunity to win one of your books. I'd love to explore your other series and this would give the chance to do so even sooner than I might have. I'm a big fan of Spencer's. He's such an interesting and multi-dimensional guy in that it's not always about ego. He has real conversations with himself about the pros and cons of life and its intricacies, making him more than just a hot stud that uses his brawn to assist Dani. Loved reading the chapters from his point of view, as well. 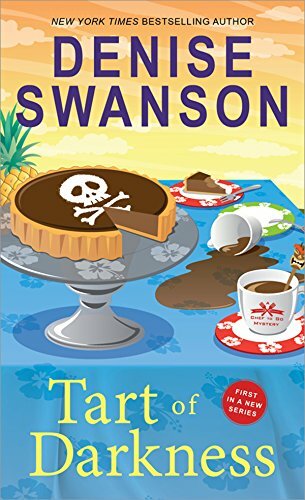 "Tart of Darkness" was delectably entertaining and I highly recommend it to anyone who loves a cozy mystery with relatable and charming characters. It’s fun seeing a sort of behind the scenes on a fictional character. This review is intriguing, I can't wait to read "Tart of Darkness"! This new series looks great! I am looking foward to reading it. Thank you for the chance to win! Can't wait to start this series. I look forward to starting this new series. Just downloaded this book! Can’t wait to start the new series!! This sounds like a great start to a new series. I really enjoyed the synopsis of the book and I'm looking forward to reading the book. I love reading this from a character's point of view. I am looking forward to your new Chef to Go series! Only problem is that I finish your books in one day as I am glued to them! Would love to get a signed copy of any of yours! Thanks for the opportunity! I'm reading "Tart of Darkness". Love it! I just received the book in the mail and anxious to start reading it. I would love to have one of your books signed. That cover continues to make me drool! You make this book so real. Thanks you. Yum! I'm in, gotta read this! Thanks for the chance to win an autographed copy of one of your books! Never read a book of yours that I didn't have trouble putting down!! I think I'll have to start this series--Spencer is an interesting character. Looking forward to Tart of Darkness. It has gotten such good reviews. Thanks for the opportunity. Tart of Darkness appeals to me & I hope the Tin Man saves the day! I, myself, dont particularly care for foodie books. Sorry! Good luck with sales Denise. Can’t wait to read this!! Love it that Spencer was n the Scumble River Book!! Welcome, Denise! Thanks so much for being my guest on the Killer Characters blog today! Thanks Denise for another great book. Love Spencer in Scrumble River love him even more now as we really get to know him in this books. I have high hopes for him & his love life wink wink I am looking forward to the next books to come. And the winner is Betsy Pauzauskie! Betsy, I PMed you on FB to get your choice of book and address.